Craig is one of the two people behind dizzy ink, probably the most prolific artistic enterprise in Nottingham at the moment. 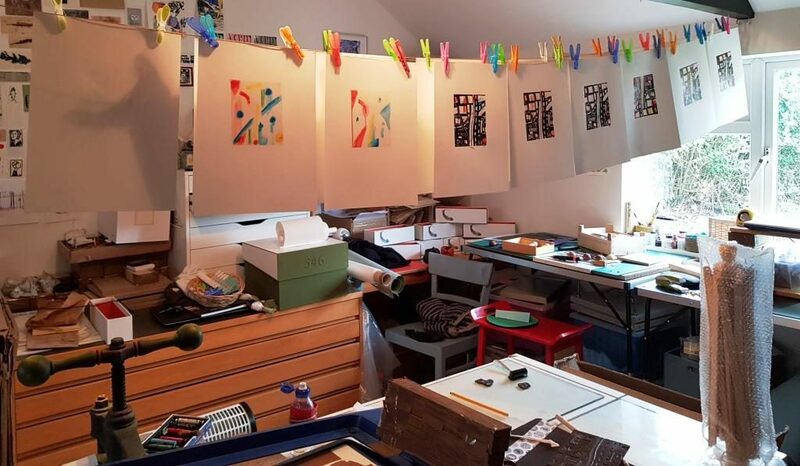 Dizzy ink is a printing and printmaking service. What sets them apart is the use of risographs. A risograph is a machine that looks and superficially works similarly to a photocopier. But instead of toner, real ink that needs to dry is being used. The process has similarities to screenprint and gocco prints. 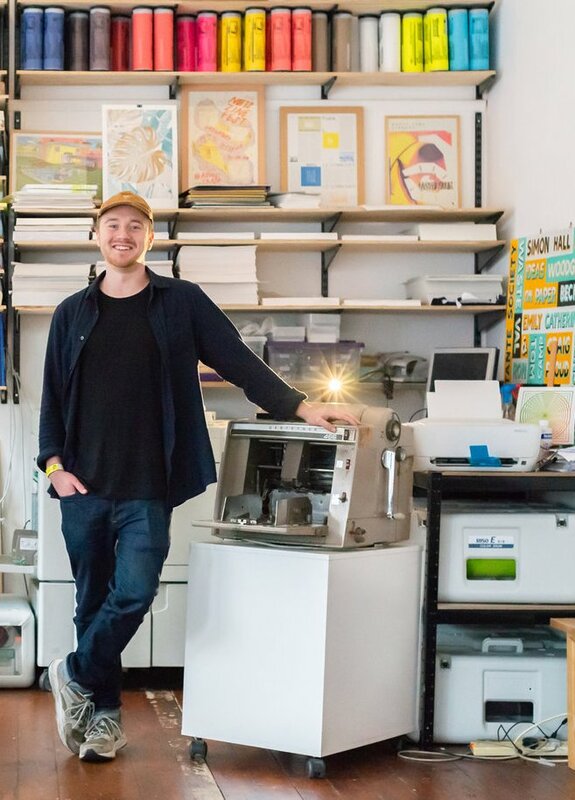 I first heard about them when in 2016 dizzy ink ran a successful kickstarter for Nottingham school of print. 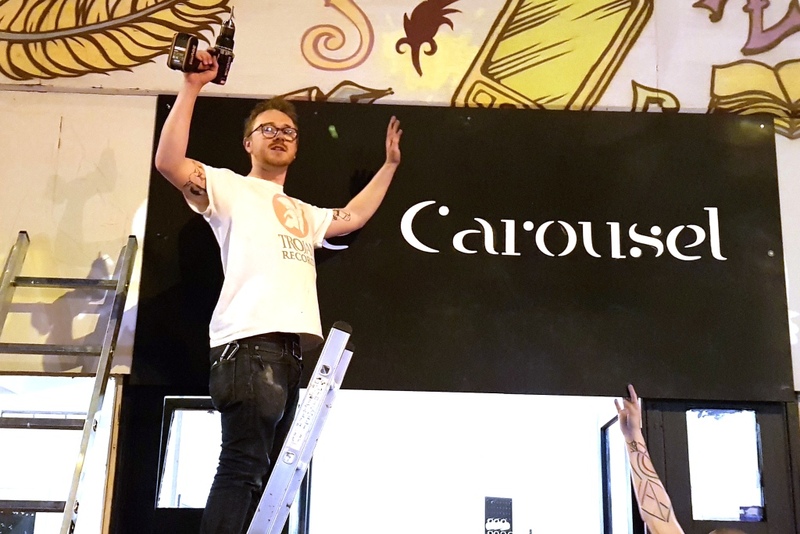 Craig at The Carousel, putting up the sign just in time for its launch on Saturday March 30th. 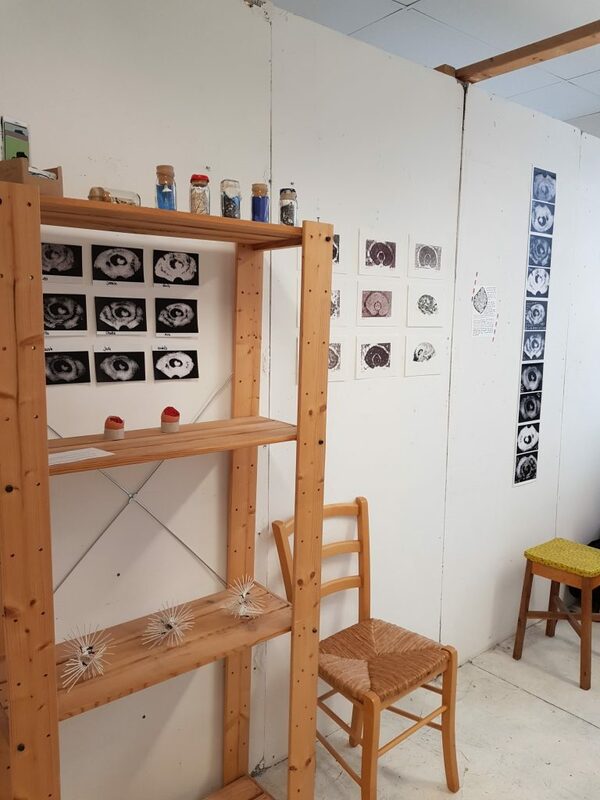 At the beginning of this year Dizzy Ink founded together with Farida Makki , and Martin Rayment a new artist workspace in Nottingham called “The Carousel”. The official launch took place just last Saturday. – Understandably, Craig is very busy. And so I am especially glad that he found time for this interview. Hello Craig, thank you for taking the time to talk with me! You do so many different things. How do you label yourself? What does your business card say where the job title is going? Ah, straight in with the difficult questions! I couldn’t put just one title on what I do! And, to be honest that’s the way I like it! Every day is different. One day I will be slogging through a huge print run, the next I’ll be researching a topic for an upcoming lecture or specialist workshop. Or I’ll be up a ladder painting. I love being my own boss but I would never want to step away from the craftsmanship that goes into making prints and books. You are referring to your work with dizzy ink, right? Maybe we can talk a bit about that. What makes dizzy ink different from a copy shop or one of the big print-on-demand services? We are not just printers, we are artists and creatives, and we meet a lot of people, and we genuinely care about your print project. There is a definite skill to Riso printing. We help with the choice of paper, file set ups, ink choice, driver control, print order, registration. It all plays a part! 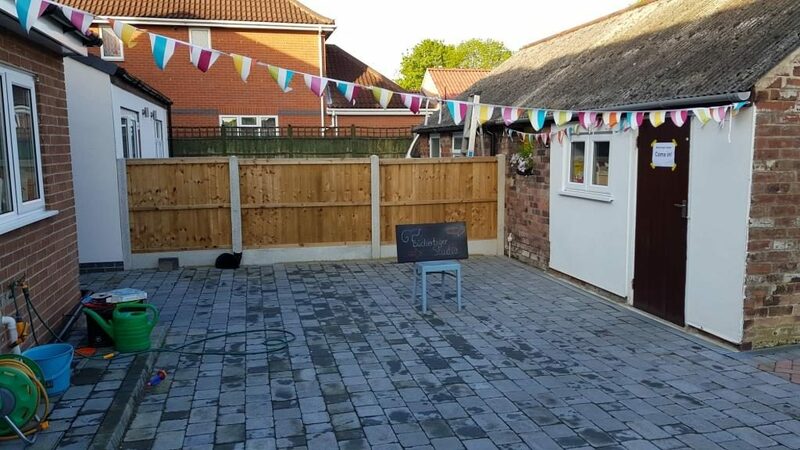 We have always been interested in teaching, too, like to help people with their projects and run workshops. Yeah I make bits and bobs. I’m really looking forward to having screen printing back in my life once it is set up at The Carousel, as I tend to use a lot of scale. Whenever I’ve had exhibitions I’ve challenged myself to make something bigger! For the 3 Months On exhibition at Derby’s QUAD I lined the entire staircase of the building with a transcript. This was all made on an architectural printer which prints on a roll. I also started making different things with a lasercutter as well. I tend to get excited by links between process and machinery. I also like learning new things so I would class myself as an experimenter rather than having a particular style. Do you have a personal website, is your art available to buy or look at online somewhere? I’m not that much into putting stuff online. My work exists on real walls. 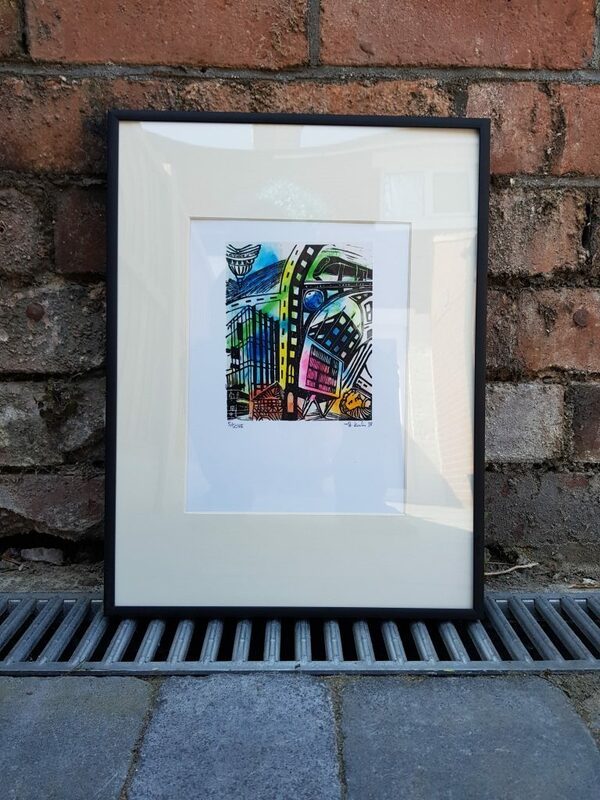 But you can see and buy some of my design work on the Dizzy Ink website! – Or commission me directly for something extra special. Sure am! I’m running the residency at Nottingham Contemporary. Not me alone but I’m leading on it. 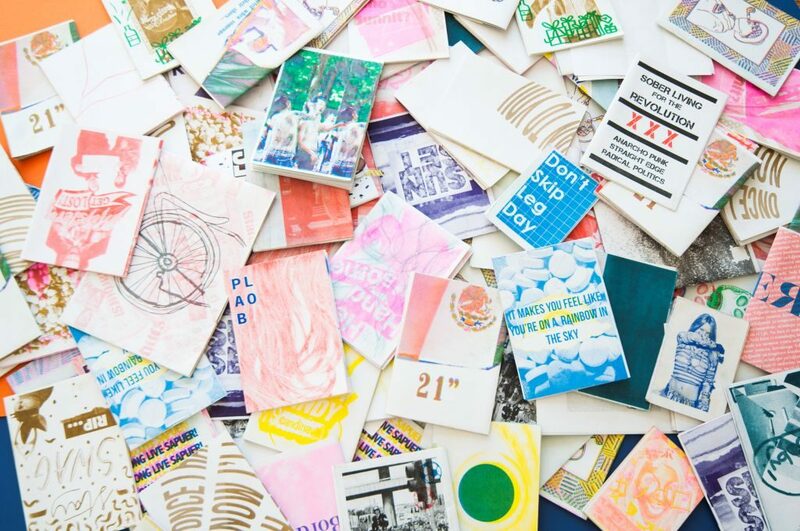 Notts Zine Library is a physical collection of self-published material, zines. It is constantly growing, so if you want to add something, you can drop it in the submission box and it will get photographed and then featured on our Instagram account, too. 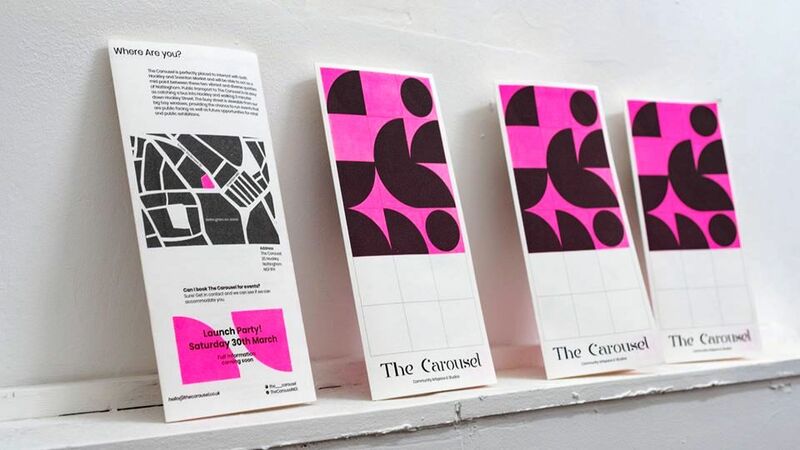 Notts Zine Library is currently in residence at The Zebrario, a room located in the Nottingham Contemporary where you have access six days a week during exhibition time – without paying admission, of course. Have you published a Zine yourself? 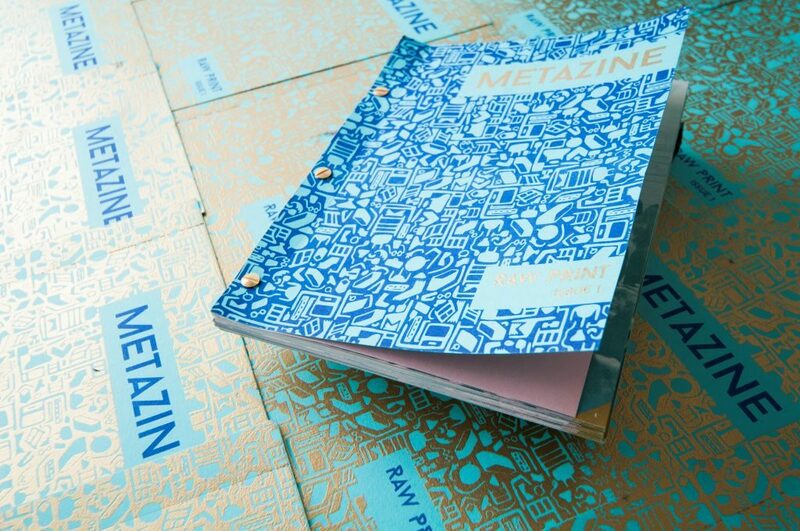 Working at Dizzy Ink on the METAZINE series with Matt Gill (Raw Print) was good as it went national and got featured in lots of other places. I have three major projects that I’ve been working on over the past couple of years. 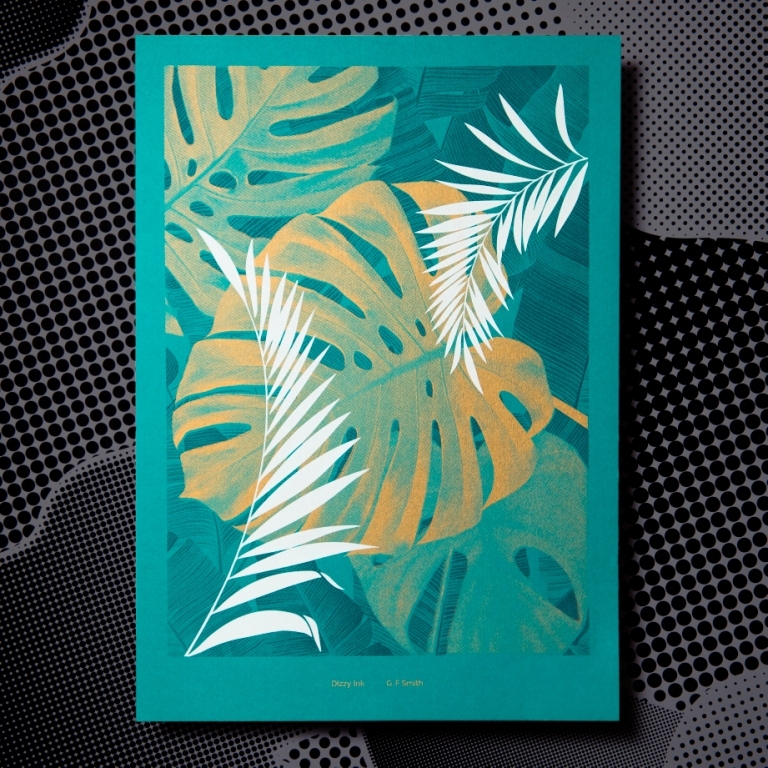 – Look out for a zine on Grillz 4 U, EVADE, Pilgrimage book & A serious swatch book with GF Smith! And now you are also involved in the birth of The Carousel, can you explain what it is? The Carousel is a space, first of all, and also stands for the concept we have for sharing this space. Dizzy Ink took residence at 25 Hockley in February, and we have high hopes for the space! This is our fifth studio in four years so really it’s about time we had a space we were going to be in for longer than a year! We’ve grown rapidly in the past years so this is a space we can grow in. We like being in a social, busy place, and this is an environment that encourages solid production of work and collaboration! 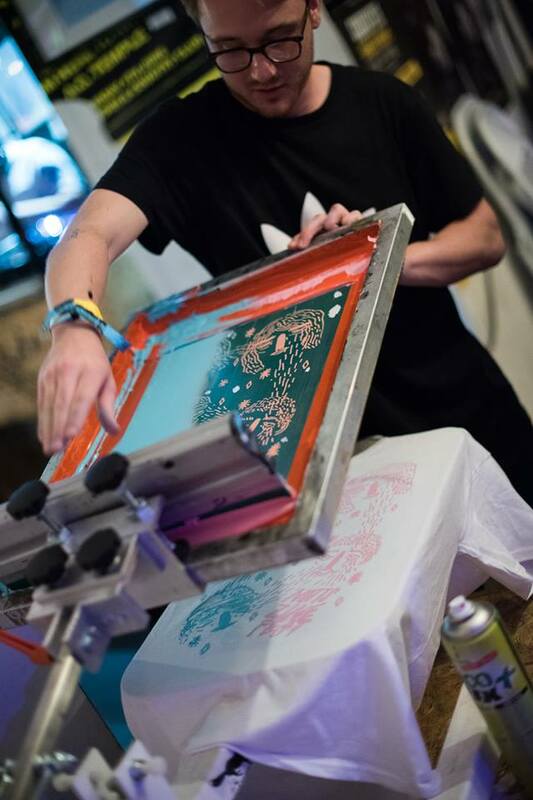 We offer open access screen printing, Risograph printing, a coworking and workshop space, in addition to artist studios. Really it’s a great place to be able to grow as a creative! That sounds terrific! – What exactly is your main role at The Carousel so far? I’ve been doing the identity for The Carousel, which is new for me. A learning curve but certainly interesting! This is a big project, and I like that it gives me the opportunity to design. Having a hand in designing the actual thing is a good part of the fun for me! I wish you the best of success for it (and I am totally not hoping to benefit fmyself ). Any personal projects in the pipeline at the moment? Got my eyes on some walls. Haha! You are keeping it mysterious. Don’t you want to tip us off where we might find some of your work? Come join the fun at The Carousel! Or do a workshop with Dizzy Ink, all good fun! Almost all images in this article were provided by Craig. – Thank you! All images are used with permission. 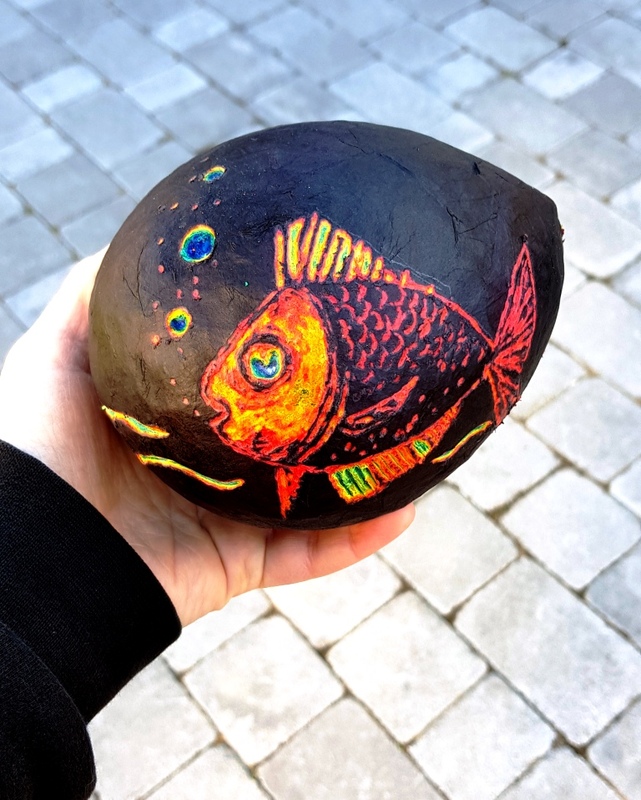 Those of you who follow my instagram, already know that in the recent week(s) I have been very busy working with papier maché. As usual I am working on several projects at the same time which are all in different states of completion. “Flight”, sculpture artwork by H. Kurzke, 2019. The tower the bird is sitting on is a found object. I believe it was once a bird feeder but I am not sure how it would have been used. 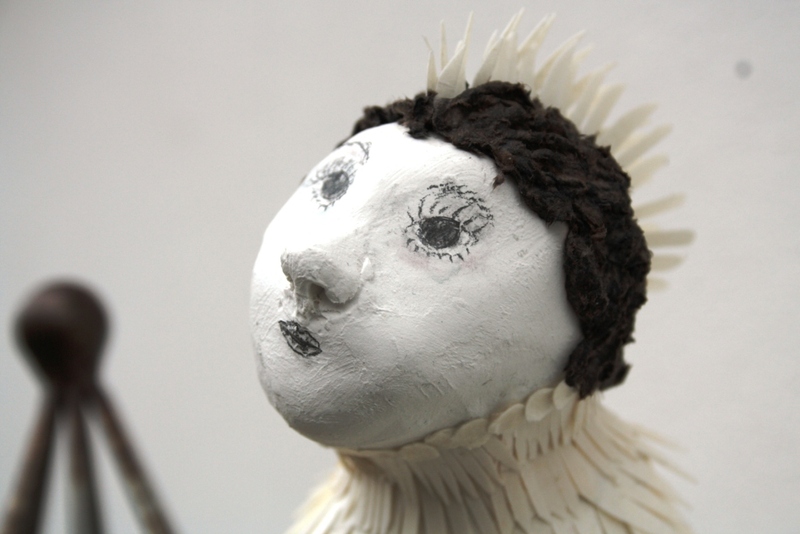 The bird-woman is made from papier mâché, parchment, piano string, wire, linen thread, and paper clay. 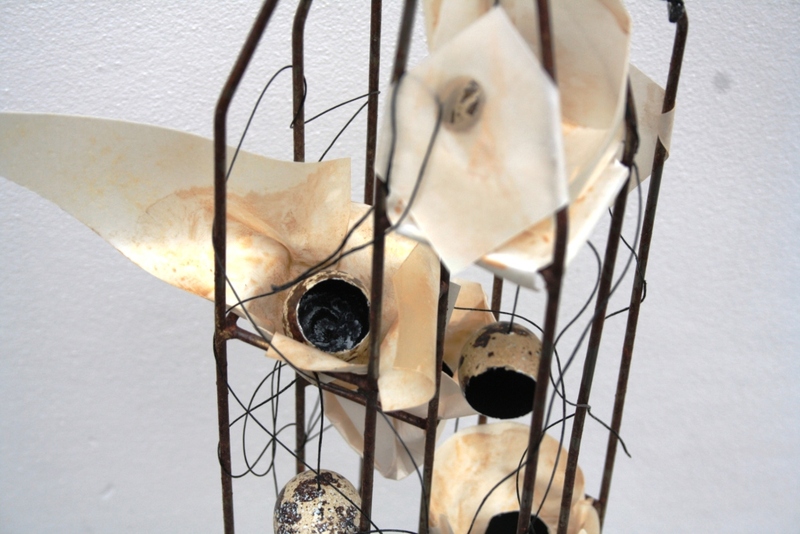 The nests are made with parchment, water acrylics, beeswax, and thread. They hold a total of 10 quails’s eggs, painted from the inside with acrylics. Detail of “Flight”, sculpture artwork by H. Kurzke, 2019, showing the face of the sculpured bird woman. The tower the bird is sitting on is a found object. I believe it was once a bird feeder but I am not sure how it would have been used. The bird-woman is made from papier mâché, parchment, piano string, wire, linen thread, and paper clay. The nests are made with parchment, water acrylics, beeswax, and thread. They hold a total of 10 quails’s eggs, painted from the inside with acrylics. 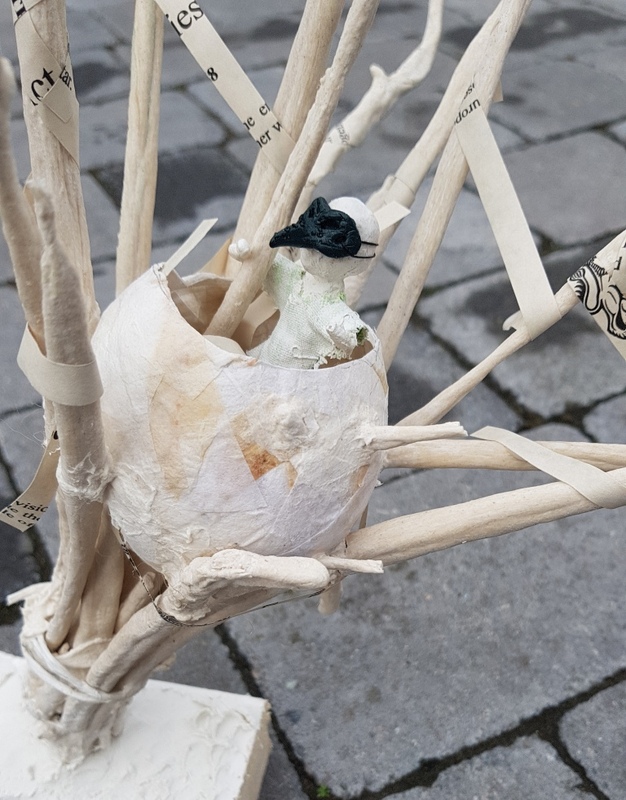 Detail of “Flight”, sculpture artwork by H. Kurzke, 2019, showing the top of the piece with the bird woman perching on top of several broken eggs. The tower the bird is sitting on is a found object. I believe it was once a bird feeder but I am not sure how it would have been used. The bird-woman is made from papier mâché, parchment, piano string, wire, linen thread, and paper clay. 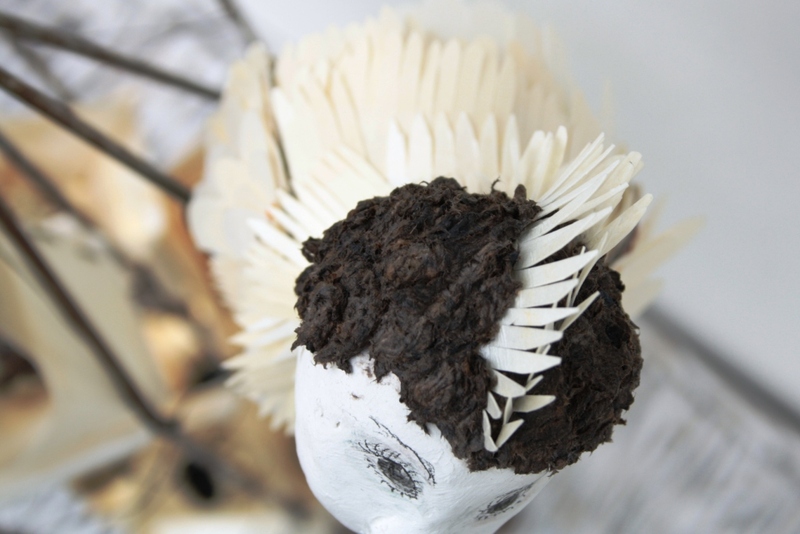 The nests are made with parchment, water acrylics, beeswax, and thread. They hold a total of 10 quails’s eggs, painted from the inside with acrylics. 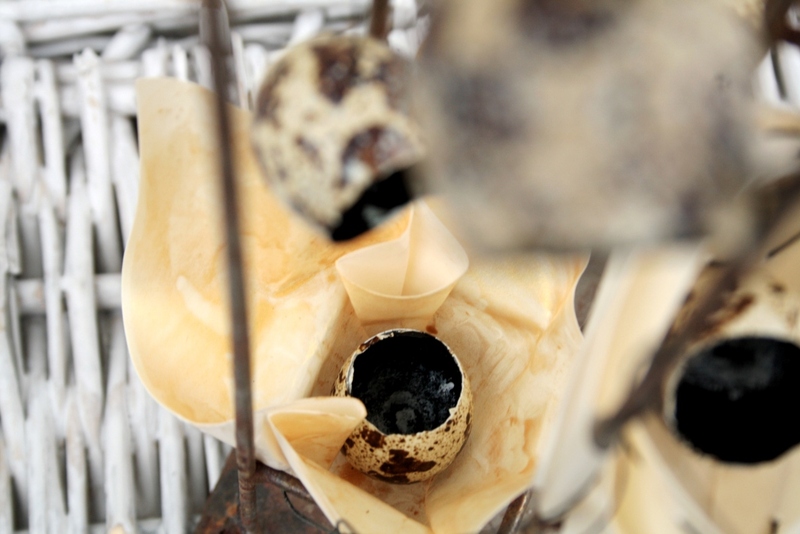 Detail of “Flight”, sculpture artwork by H. Kurzke, 2019, showing the inside of one of the painted quail’s eggs. The tower the bird is sitting on is a found object. I believe it was once a bird feeder but I am not sure how it would have been used. 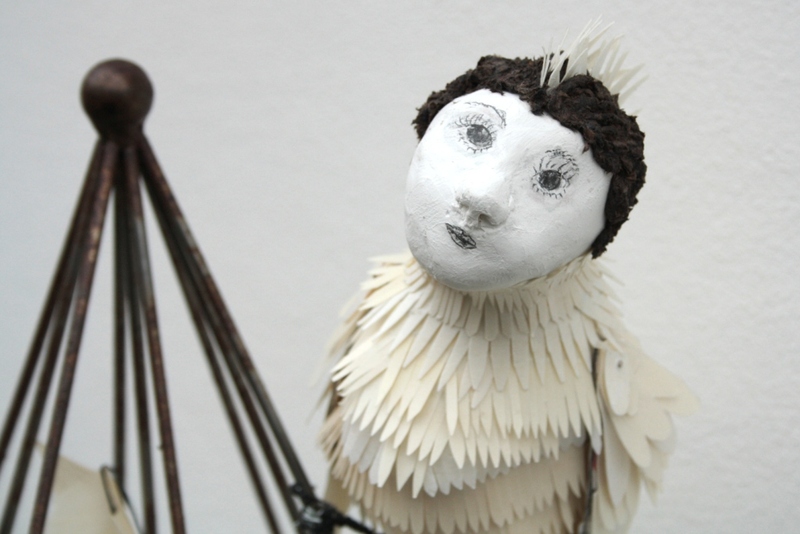 The bird-woman is made from papier mâché, parchment, piano string, wire, linen thread, and paper clay. 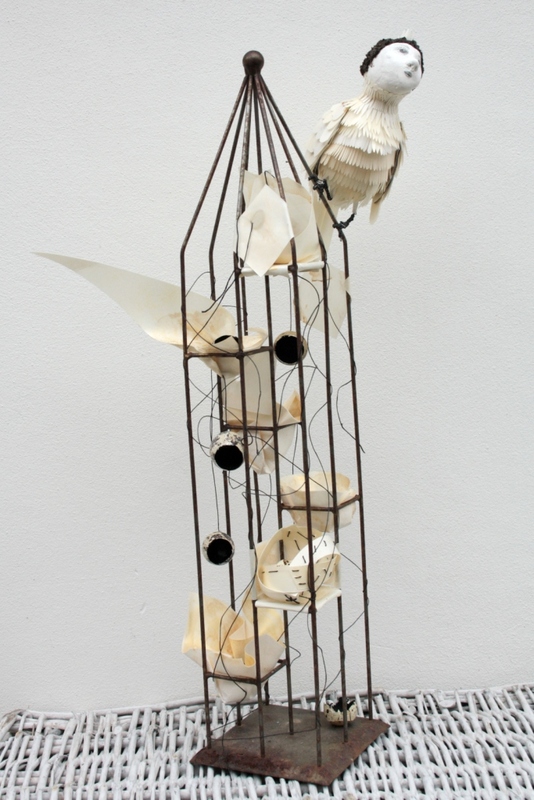 The nests are made with parchment, water acrylics, beeswax, and thread. They hold a total of 10 quails’s eggs, painted from the inside with acrylics. 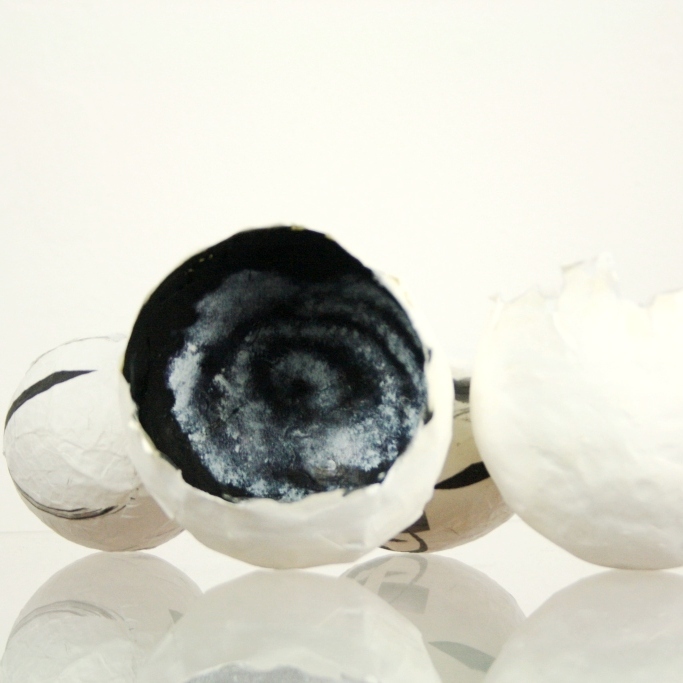 Detail of “Flight”, sculpture artwork by H. Kurzke, 2019, showing the inside of one of the painted quail’s eggs – this one here is just black. The tower the bird is sitting on is a found object. I believe it was once a bird feeder but I am not sure how it would have been used. The bird-woman is made from papier mâché, parchment, piano string, wire, linen thread, and paper clay. The nests are made with parchment, water acrylics, beeswax, and thread. They hold a total of 10 quails’s eggs, painted from the inside with acrylics. 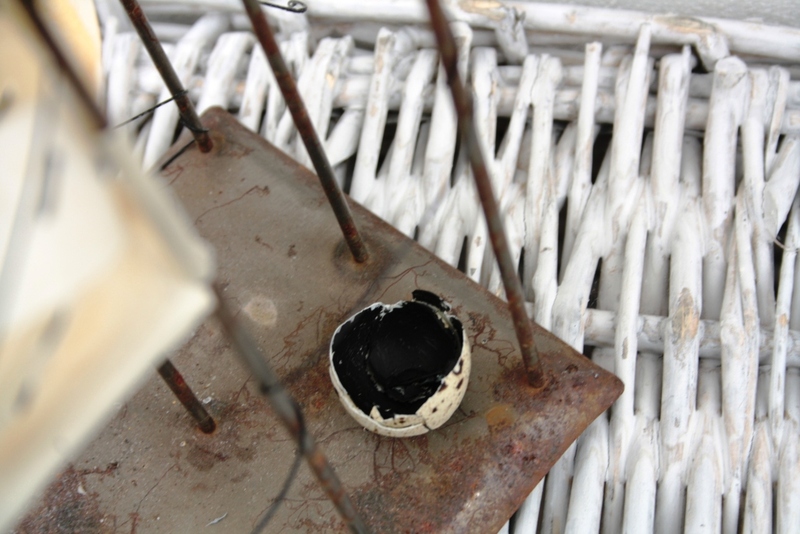 Detail of “Flight”, sculpture artwork by H. Kurzke, 2019, showing the inside of one of the painted quail’s eggs. – this one is broken inso several pieces, sits at the very bottom and is painted just black. The tower the bird is sitting on is a found object. I believe it was once a bird feeder but I am not sure how it would have been used. The bird-woman is made from papier mâché, parchment, piano string, wire, linen thread, and paper clay. The nests are made with parchment, water acrylics, beeswax, and thread. They hold a total of 10 quails’s eggs, painted from the inside with acrylics. 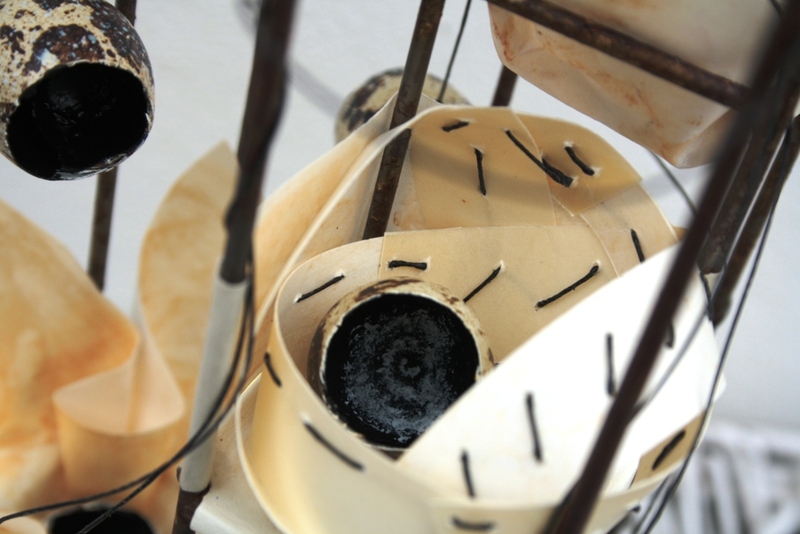 Detail of “Flight”, sculpture artwork by H. Kurzke, 2019, showing the top view onto the nests. The tower the bird is sitting on is a found object. I believe it was once a bird feeder but I am not sure how it would have been used. 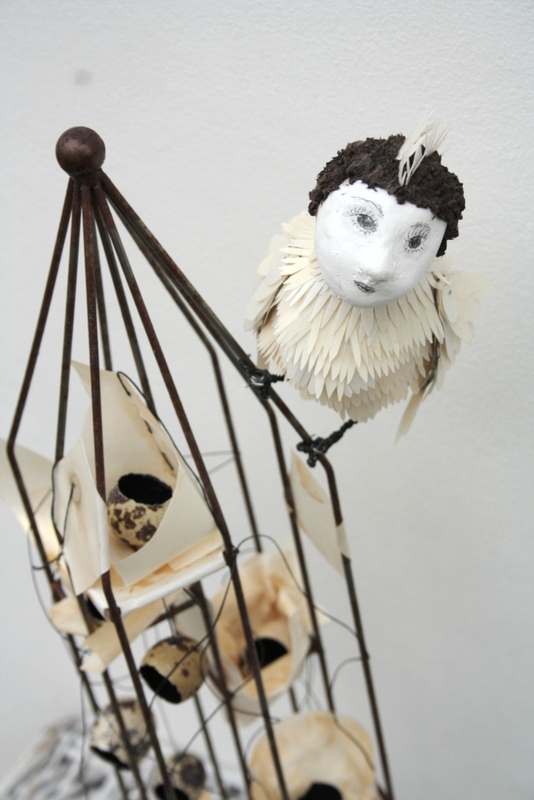 The bird-woman is made from papier mâché, parchment, piano string, wire, linen thread, and paper clay. 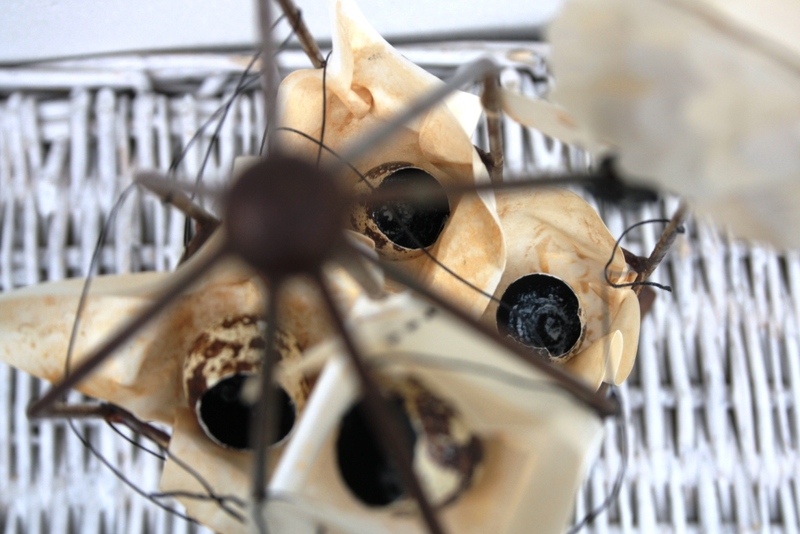 The nests are made with parchment, water acrylics, beeswax, and thread. They hold a total of 10 quails’s eggs, painted from the inside with acrylics. 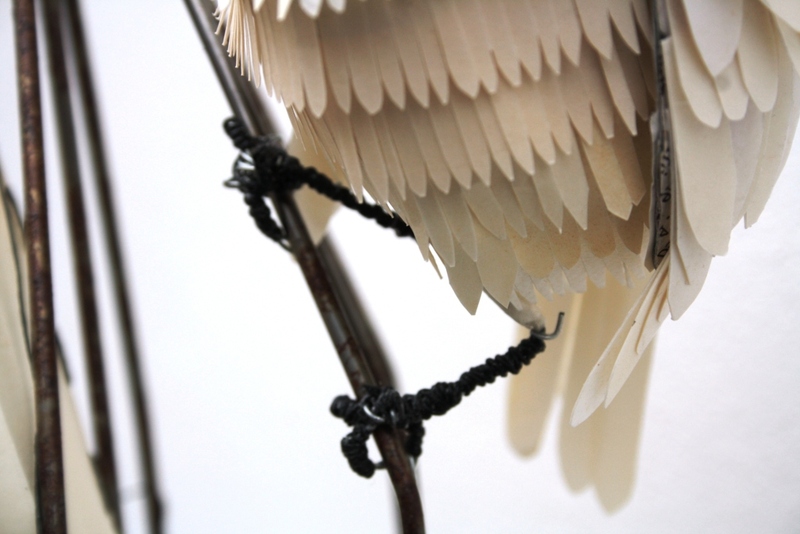 Detail of “Flight”, sculpture artwork by H. Kurzke, 2019, showing the head of the bird woman. The tower the bird is sitting on is a found object. I believe it was once a bird feeder but I am not sure how it would have been used. The bird-woman is made from papier mâché, parchment, piano string, wire, linen thread, and paper clay. 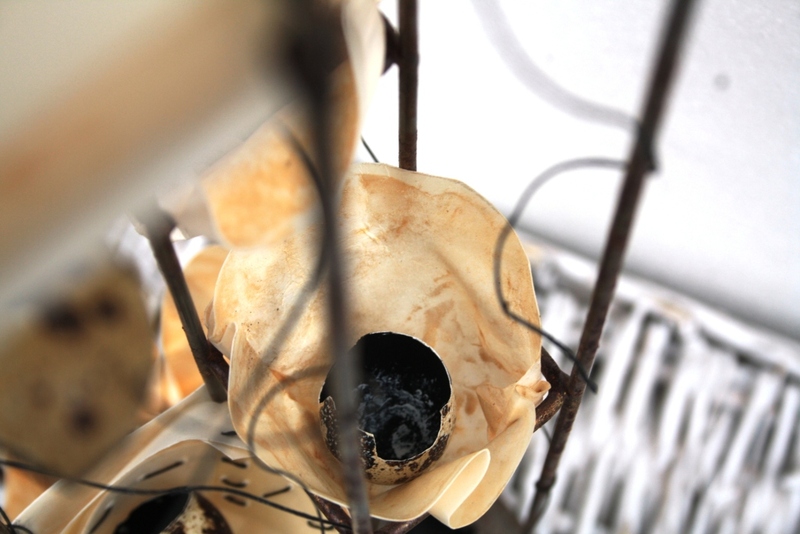 The nests are made with parchment, water acrylics, beeswax, and thread. They hold a total of 10 quails’s eggs, painted from the inside with acrylics. 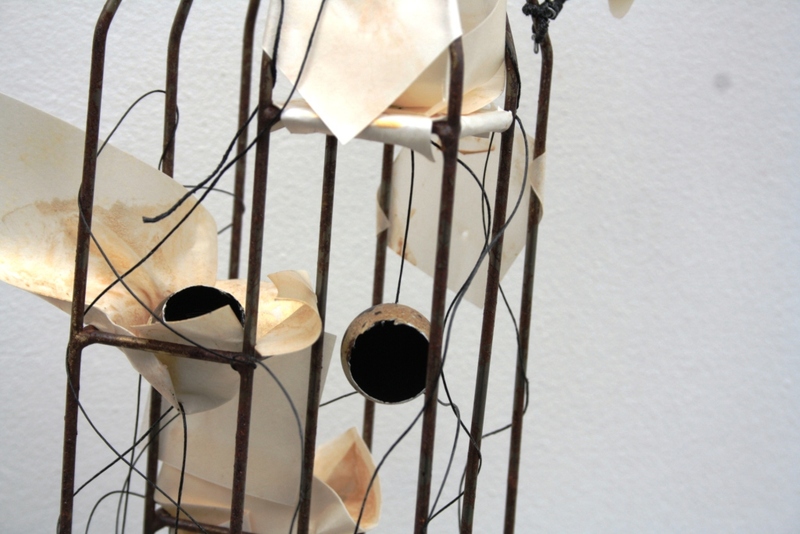 Detail of “Flight”, sculpture artwork by H. Kurzke, 2019, showing the feet of the bird woman clinking on to the iron cage. The tower the bird is sitting on is a found object. I believe it was once a bird feeder but I am not sure how it would have been used. The bird-woman is made from papier mâché, parchment, piano string, wire, linen thread, and paper clay. 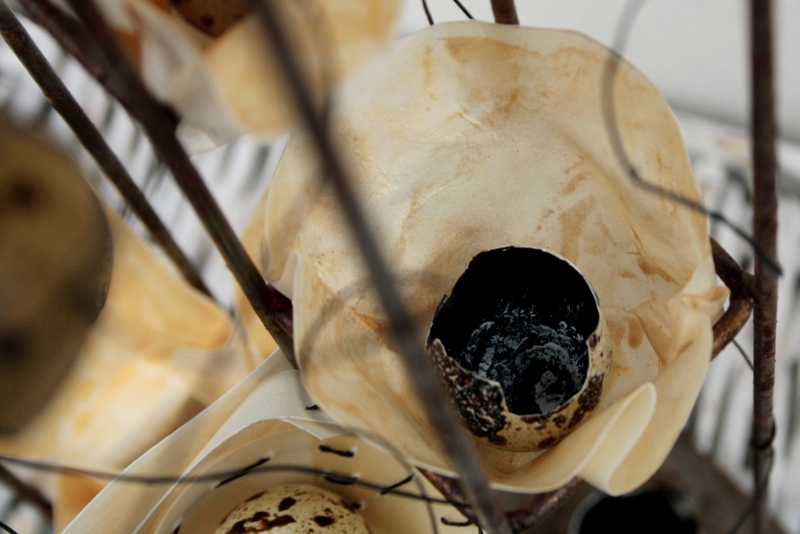 The nests are made with parchment, water acrylics, beeswax, and thread. They hold a total of 10 quails’s eggs, painted from the inside with acrylics. The ambiguity of the title is deliberate: is this bird woman pushing off to leap into the air any minute? To fly or to flee? Or is it her children who have fled? This piece is the result of my ongoing work surrounding pregnancy, miscarriage, and perception of women and their bodies in public and prescription of norms by the public, especially in the context of procreation. Before I go on to tell you how I interprete my own work, I want to stress that I strongly believe in the right of the viewer to interprete a piece in their own mind. I can well imagine that for some of you it means something different than for me. And to me, this different interpretation is just as valid, if not more so, than my own explanation. 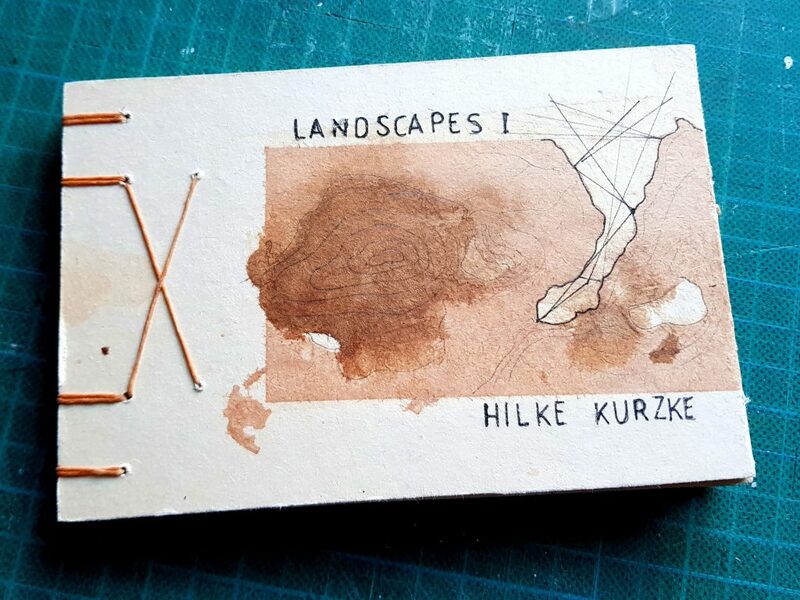 To me this t is ultimately the strong(est) point of visual art: The fact that it invites personal experiences and approaches, that it is not as precise in the meaning it can take as a scientific treatise. For me “Flight” is about the freedom of a woman to stay herself even in the context of pregnancy, whether failed or successful; about the right to feel about it in whatever way she does, and stay in control over how to deal with the outcome. 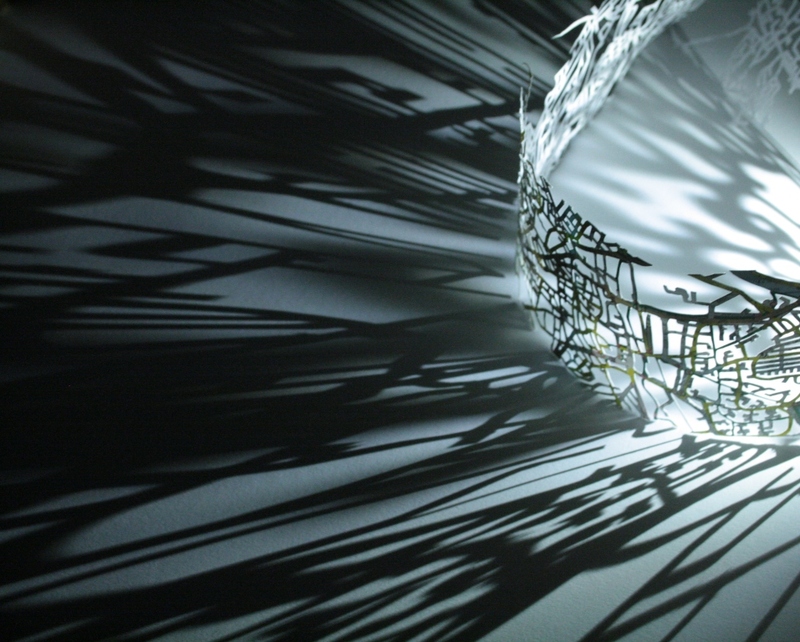 When I started, I set out to create a sculpture about miscarriage and IVF. I first placed leftover syringes, shredded prescription leaflets, and empty medicine bottles on the bottom of the piece. While finishing, however, I realised that this was too much, and I took them away. Because I like the possibility of a wider interpretation: It doesn’t have to be about IVF, my message applies everywhere. Nevertheless, the trials of women who only – if at all – get pregnant after several rounds of IVF were at the forefront of my mind when I started to create this. The blackness inside the eggs, the image of a beginning pregnancy, the gold on the nests which nevertheless seem tattered and abandoned stand for unsuccessful attempts. In this trail of thought, it is life, offspring, babies who are fleeting and fleeing here. But look at where I placed the bird-woman: She is perching on top of it all. I could have put her between bars, imprisoned and surrounded by her nests, but I very deliberately didn’t. Whatever happened, however much it might shape and influence her, it doesn’t have to define her. It is her choice to stay or leap off, leave it all behind, and set off to something new. So she, too, might be fleeing, or maybe just flying away. I am currently making 10 such eggs with something that resembles an early pregnancy ultrasound scan inside. These are fairly large paper mache sculptures, about the size of an ostrich egg. This work is still very much in progress; I intend to add sculptural elements to the eggs which will feature as a central element. 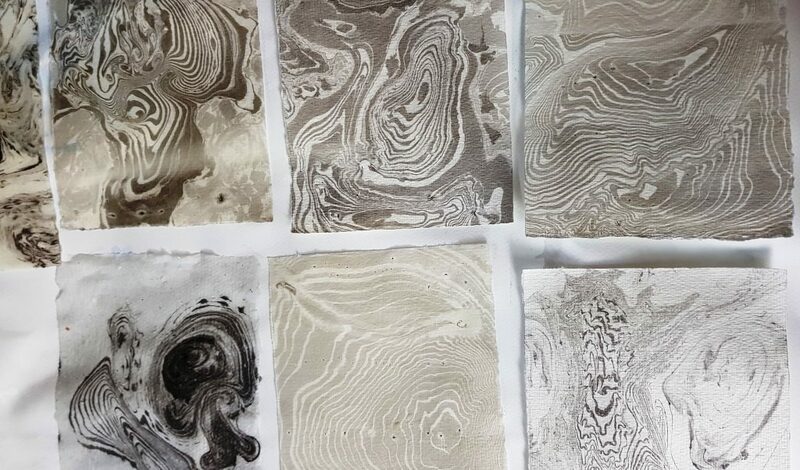 This piece(s) draw on work on prints that I did a while back, where I used indirect printing with unbaked polymer clay to achieve a look of an ultrasound image. I printed computer processed images of the prints and put them inside these eggs. After added layer upon layer of paste and paper, the print itself became really faint, thought, and I painted over the image to enhance the contrast. But in theory these are still copies of those prints. Valentine’s Day is over, and you might be wondering why I have not drawn a prize winner of my announced competition yet. I am pleased to announce now that the deadline for entries was extended. Instead of closing the entries on the 14th of Febuary as announced, you now have two more weeks, and I’ll pull a winner on the 28th. Skillshare is a paid-for platform of learning. You can access all kinds of high-quality content there. If you sign up to a year’s membershop on skillshare through my class referal link: https://skl.sh/2RYKqsk you’ll get the first two month’s off, and I’ll earn a referal fee. Signing up to skillshare gives you access to all my classes and to tens of thousands of more classes on all kinds of subjects, whether you want to get crafting, want to take a life-coaching class, or learn a language. 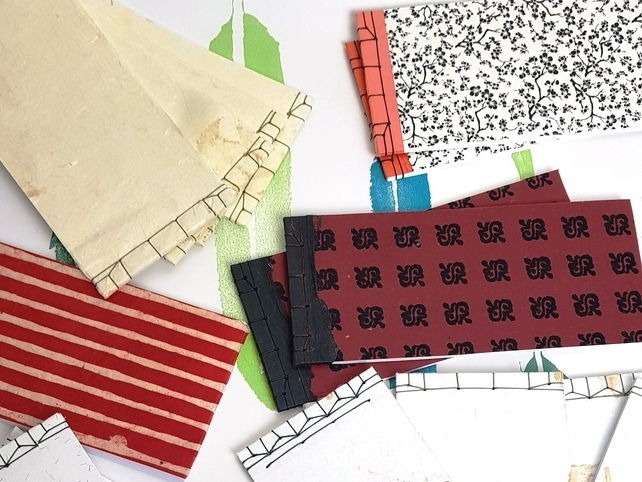 In the meantime, I started to work on a follow up class already, introducing different stitching variations of 2-needle Coptic bindings. – I hope to see you in this course or the next! It is already Febuary, wow, how the time has flown! I used January mostly to film, edit and upload my newest skillshare class: Coptic Bindings. A Beginner’s Course. The following is a teaser for the class. Make sure you check further down for ways to see it for free, and how to win a one year premium membership on skillshare. You’ll get the first two month’s off, and I’ll earn a referal fee. Signing up to skillshare gives you access to all my classes and to tens of thousands of more classes on all kinds of subjects, whether you want to get crafting, want to take a life-coaching class, or learn a language. You can see this class completely for free. (You won’t gain access to other courses, though). And last but not least: It’s competition time! 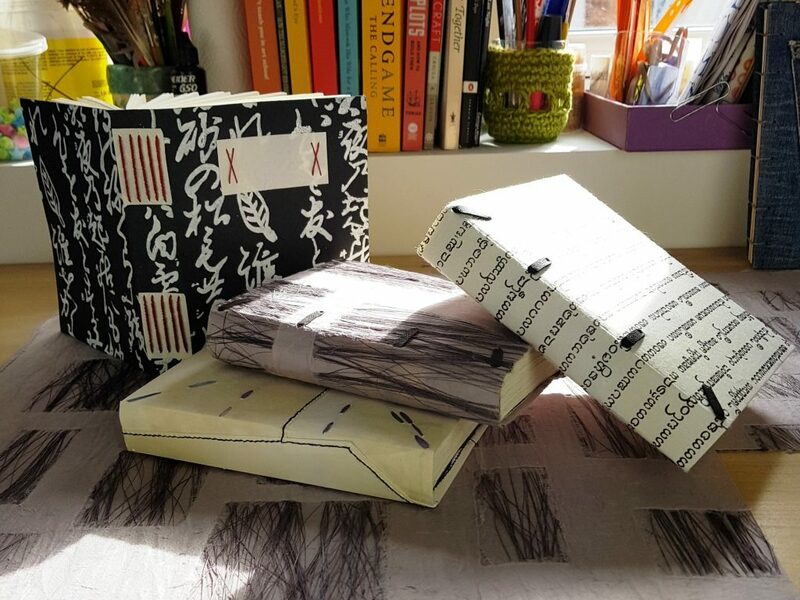 Finish the class project (a book bound in the taught style) and post a photo of it in the project section. Each book counts as one entry. On the night of Febuary 14th*, I shall put all names/books in a hat and pull one name from it. Whoever I pull out wins the prize. Obviously you’ll have to trust me that I am doing this as fairly as I can, and can’t take me to court over the decision afterwards. Winners will be announced in the community section on skillshare. *evening means evening in the UK; I’ll post in the community section when I am closing entries, and the specific time I am doing this will be depending on my family life on the day and cannot be predicted at this moment, not even by me, sorry for all who come just a little too late. I hope to “see” you there as one of my students! I wish you all a happy and creative 2019. I wish for you to have a wealth of experiences, many joyful ones, and that you may grow from those which are challenging, unpleasant, and sad. It is customary to wish for a happy year (and I did so in the title), and I do hope 2019 will be a good year for you all. For all for who this won’t come true, I wish we will recover from whatever will make it a hard year, and come out at the end as better, wiser, stronger, and hopefully we’ll be able to turn all of it, the good and the bad into great art. 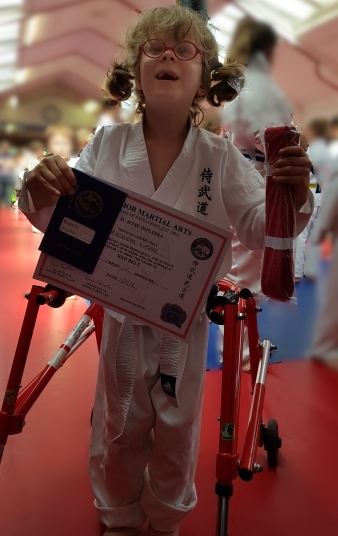 The year past has been a tough year for us as a family, and I felt unable to do write my usual wrap-up before Christmas because looking back felt too hard a task. There is this saying “you are only ever as happy as your unhappiest child”. I have quoted this line a lot for the past six months or so. But of course this is ultimately not true, it’s too general a statement to begin with. I think I was much happier than my child since her surgery in the summer. But to make up for it, other than she, I worried the whole year approaching it. So as a rough guideline, I do believe in that piece of wisdom. The surgery she had in early August was meant to maintain her motor function and hopefully, ultimately it will do that. Her surgeon tells us it’s still early days. But as things are now, it has brought her from independent walking to being a full time wheelchair user who hardly can weightbear. With it her care needs and thus my workload (and M’s) increased. But graver than the physical scars and effects has been the psychological impact this has had on her and us. Although since August as many as four (or was it five?) people have written letters asking for psychological support, some of them twice, as far as I know she still is not even on even on a waiting list for the children’s mental health service. For the first time I feel like we have been let down by the system. I don’t want to burden you with my children’s troubles, and to be honest, I don’t really want to talk in publicy about their specific health issues. I mention it here because it did have a major impact on my work: I felt unable to respond to calls for art, and was awful at keeping deadlines. 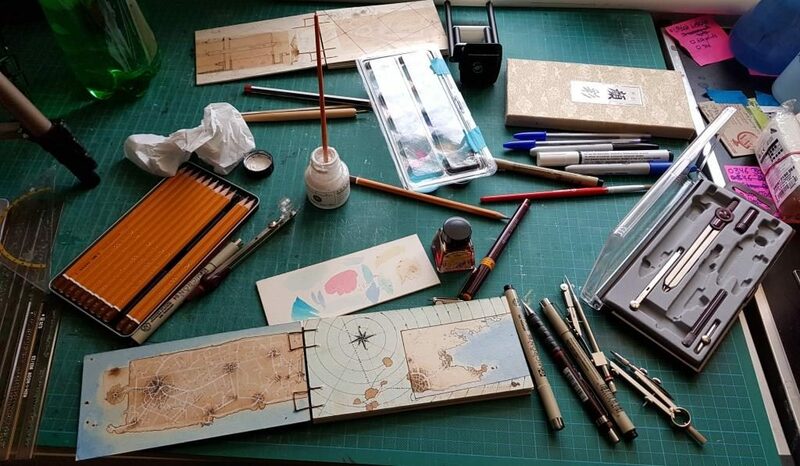 When I found the time to work, I really just wanted to be alone in my studio, rather than putting my work out there. In January I was mostly occupied with shop care for Büchertiger Supplies: I added jute twine and cotton twine to my range of threads, and started to scout for silk threads I wanted to add. I also worked on completing the scrolls for my long term project 346. Technically I started my instagram account and photostream December 31st 2017, but I really started in Febuary when I drew my daily maps. I love instagram, and with the maps-project, I started a “picture a day” stream which – although I am less strict with myself by now – I still try to maintain: One picture a day which best summarizes what I did that day. So if you don’t already, you may want to follow me there for a glimpse behind the scene and in-process pictures. In March I finally added silk thread to my stock for Büchertiger Supplies after testing it on headbands. 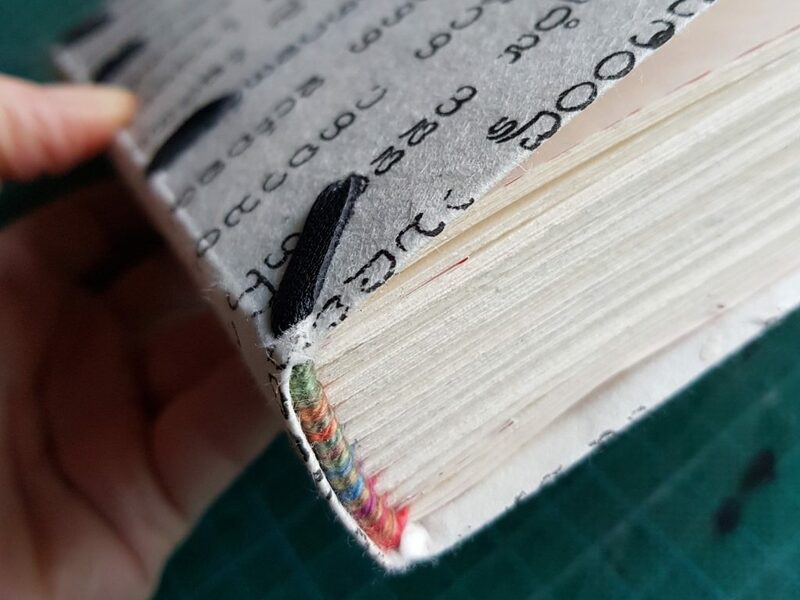 I learned to bind books in limp parchment technique. 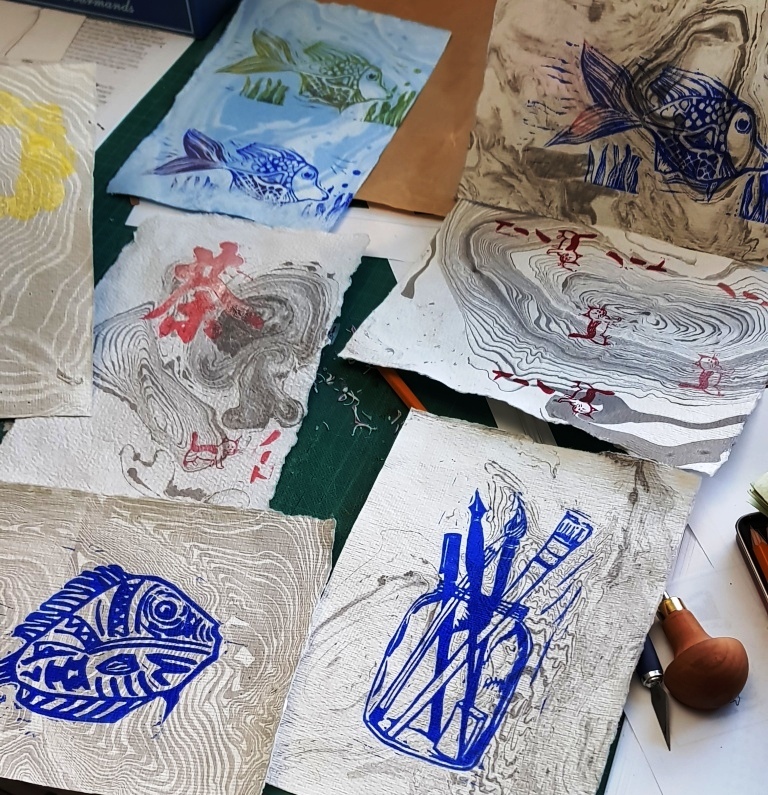 I also started investigating screenprinting more and especially in combination with lino prints. The first version of my Nottingham prints came to life, very much inspired by my daily map drawing which at that point I still maintained. End of March, beginning of April I started to cut up a slice of a Nottingham street map. I then continue to make photos and sunprints from the cut-paper. But somehow this never amounted to much. But I still have all those photographs and prints, and maybe I’ll make soemthing of it yet. I also started to learn Japanese in April: Inspired by my writing / map experiments, and thinking about how to encode language and information in marks on paper, I became interested in the Japanese way of using three different “alphabets” (if you want to call them that) to encode language. I had some more fun printing in April, most of it in preparation of my first open studio event. 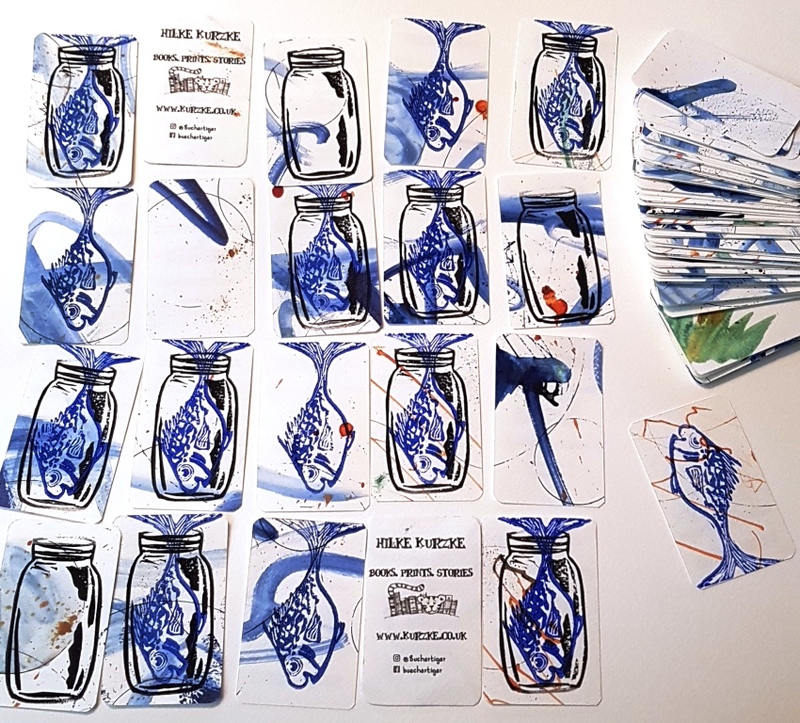 I printed my first set of business cards completely by hand: fish in a jar on a water-colour background. I first dyed my hair blue in April. End of May I participated in Backlit’s Open Studios as a guest, and in early June we spent a weekend at the seaside to celebrate the twin’s 7th birthday. 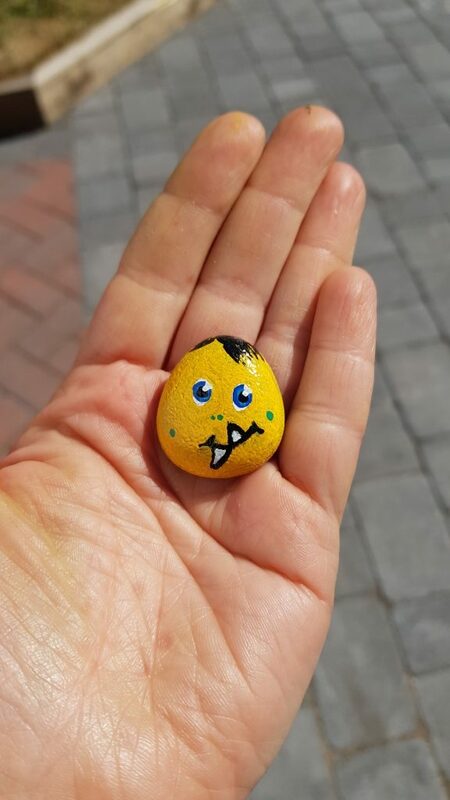 There on the beach I found a painted rock from #nottsrocks which then let me to paint and hide a lot of rocks myself during June and July. I layered coloured paper and cut into it, and made pictures like that. 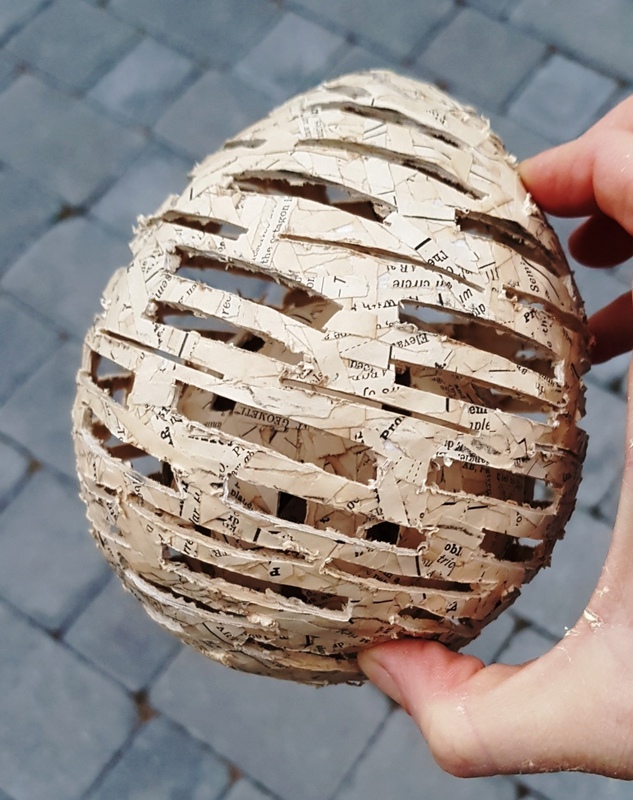 The sphere I made is finished. I also tried some planar images with the same technique. The building up of layers is time intensive, as you can only do a couple of layers per day, and then it has to dry. My first outcome was not very satisfying, but I still have some more experiments to do in that regard! 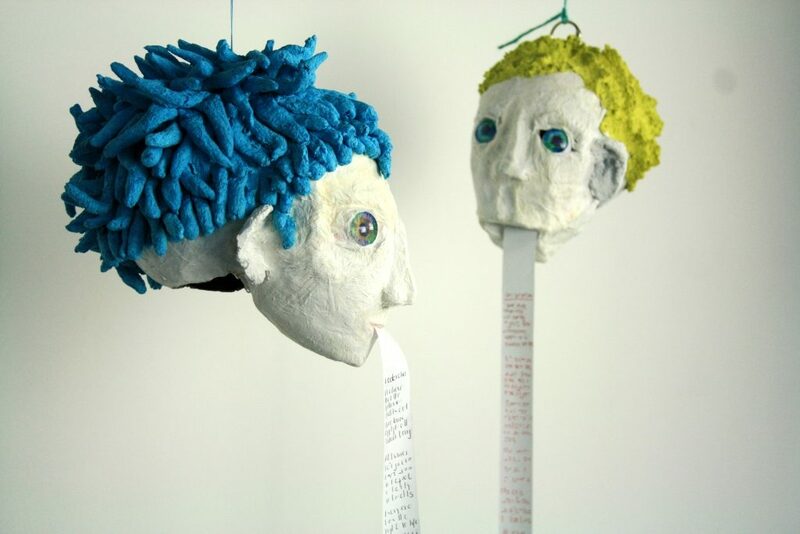 I also made three “talking” heads, and another paper mache sculpture: “sailing”. I have not properly photographed all these, although they have been finished for a while now. They are my most political work so far. 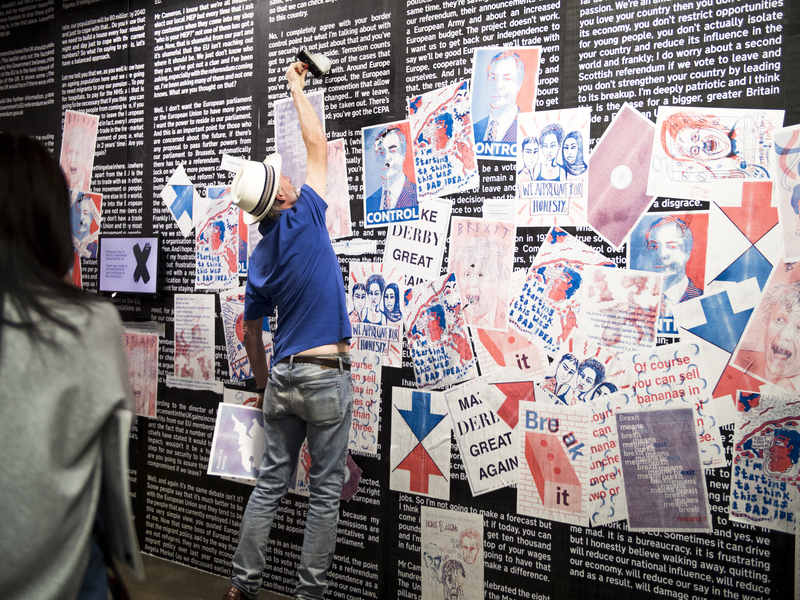 – Brexit, the general climate it has generated in the UK, the evil it has come from and will lead to, this all got me deeply worried and although I don’t usually work politically, I poured all my worries into these pieces. In July the school term ends, and thus – mostly – my work time until August. August then turned out difficult due to hospital stay and subsequent coping – or not – with the new situation. I had long before decided to dedicate the second half of the year to my writing: – As you might know, I am currently working on a novel (I hope I’ll eventually finish it!). All of this took me well into October, when I took a couple of days off my care load at home and instead resettled for three nights (five days) to a hotel in Sheffield where I indeed got a good chunk of writing done, and also posted a number of messages in bottles. End of October then was the next open studio event at Backlit where I again had a chance to participate as a guest. I showed my “talking heads” as well as 346, but had the most interesting conversations and interactions about the heads. The two heads each “spit out” part of a scroll, and by superimposing the two images, you can read a declaration of human rights. At the end I left space for people to sign, and indeed did gather some signatures from visitors. 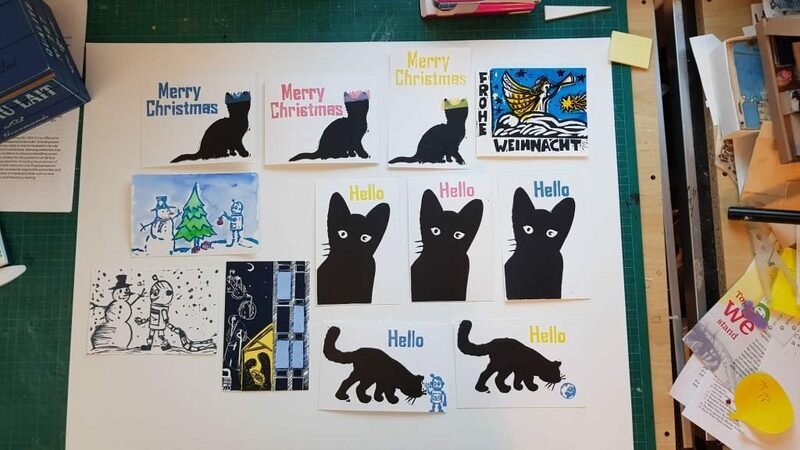 In November I started my robot a day challenge, made books and prints and prepared for the small Christmas events at Backlit and the German Academy. 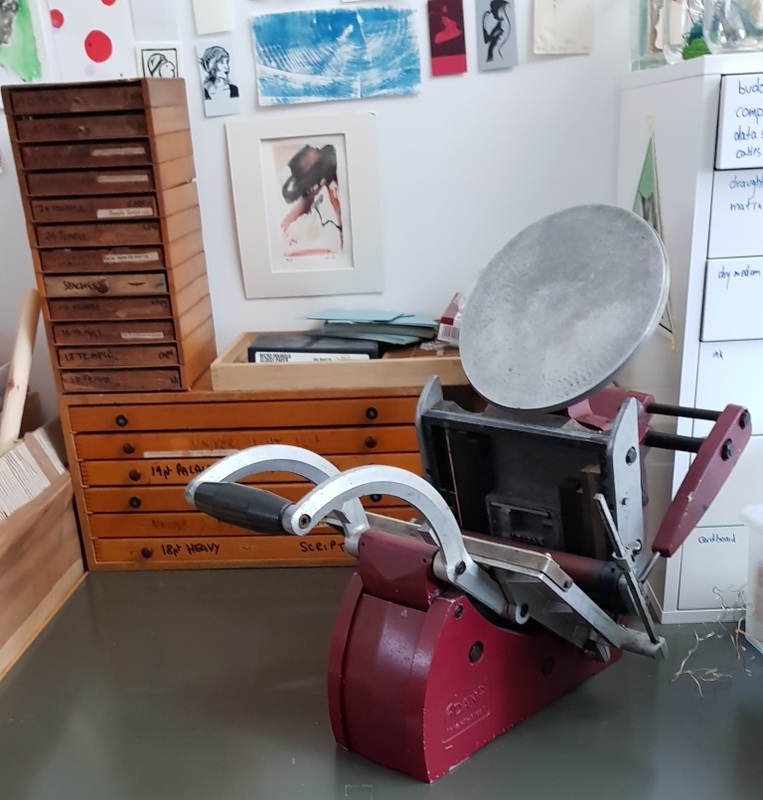 I tried my screenprinting for real, I experimented with suminagashi, I made some books, and I bought myself my very first letterpress. And then – it was already Christmas! So, in summary: It was a year of firsts and a year of learning. 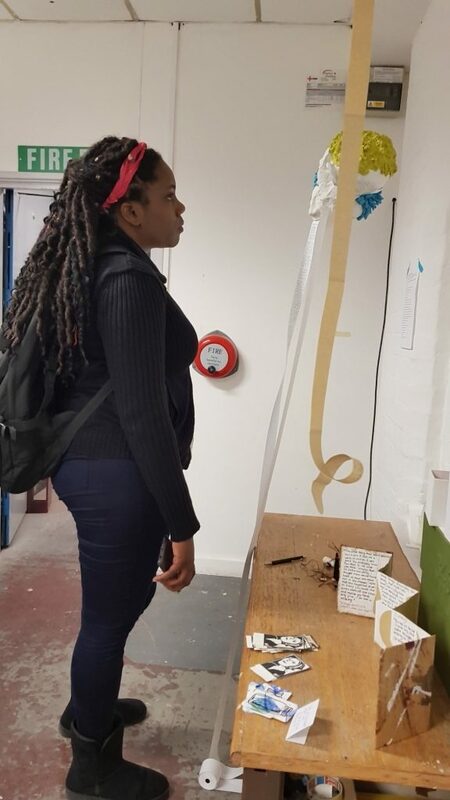 I worked with eggshells, my work got more politised, I printed more, I used my screens for screenprinting, I learned to work with papier mache, I started to learn Japanese, I started to experience suminagashi and papercuts. I learned about asemic art, thought a lot, about language and writing and politics, and the medical system. And I thought and wrote about what makes a person, about the connection of memory and identity, because that is the content of the novel I am working on. What I didn’t do was promote myself enough to get into any exhibition, which I feel really bad about. 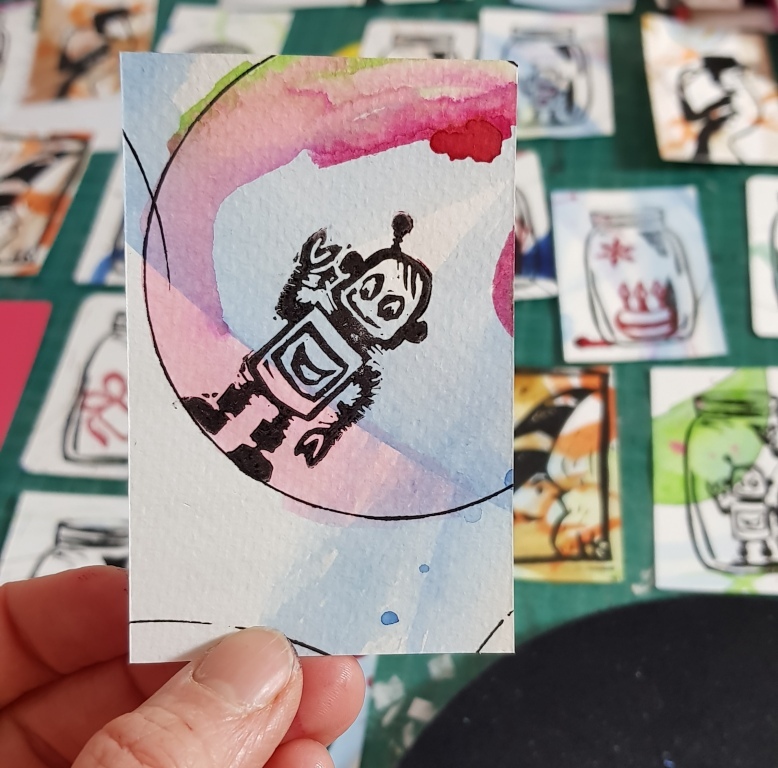 I did not even manage to get one of my postcards into an postcard show which will open this Friday, and I feel especially regretful about that. I know I should be out there, finding ways to show 346, my papier mache, maybe even my maps. – I just felt too much drained of energy. And with the lack of exhibiting came a lot of doubt: Am I really an artist? What am I doing, spending years on trying to write a novel? Can I really be writer? What am I doing and why? Does this all make sense? And less philosophically: Maybe I should concentrate fully on Büchertiger Supplies. It could do with more attention, it brings in real money, and maybe should be my main professional focus. But I do feel more like an artist than like a retailer! Also, who knows what Brexit will bring. I also have been teaching German in 2018, and I blame this among other things for the lack of time, the chased feeling, and lack of energy in this past year. Thus I quit. In 2019 I won’t be teaching, at least not German. 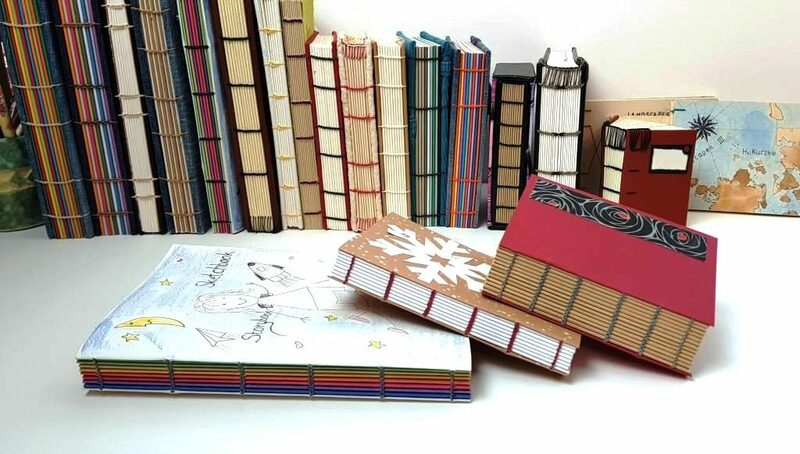 – A bookbinding workshop is already planned. (Sign up here. ) I hope this will make it easier to make art, and equally important, to get it out there. And for my writing: My mentor (I am currently participating in a mentoring scheme) recommends I start making contacts in the publishing world now. 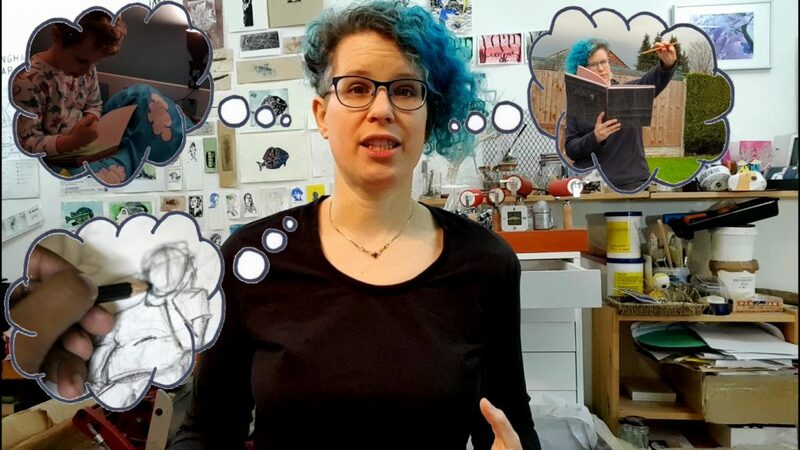 I should research which kinds of publishers are interesting for me, who they are, and how to approach them, show up at networking events, talk to people… – All the kind of things I have failed to do for my art now come up for my writing. And thus it officially stops being the evasive thing it started out to be. I have a lot of plans. Whenever I make anything, I come up with a thousand other things I want to do. 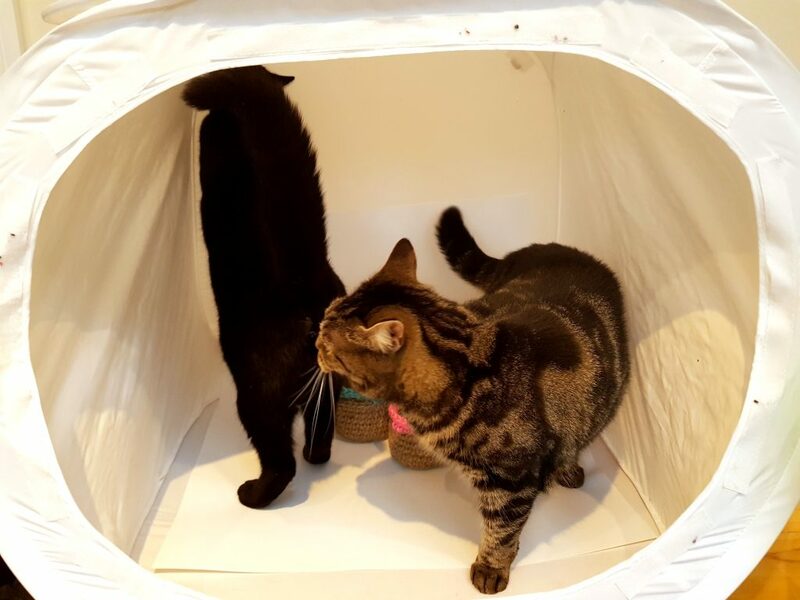 Finding things to do is the easy part, and I won’t bore you with going on any further in this blog post which is already much too long. The challenge for me this year will be not just to learn things and to make things but to get them out there. So this is my aim for 2019: For me to be more daring, to make an effort to get out there, meet people, put my work out there. I don’t know yet how I am going to do it, or where to find the strength to do so. But I want to make a real effort to get it done! What are your plans and challenges?